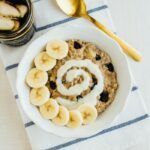 A tried and true favorite, this cinnamon raisin oatmeal is super easy to make and oh so delicious. Plus it takes less than 10 minutes to whip up. 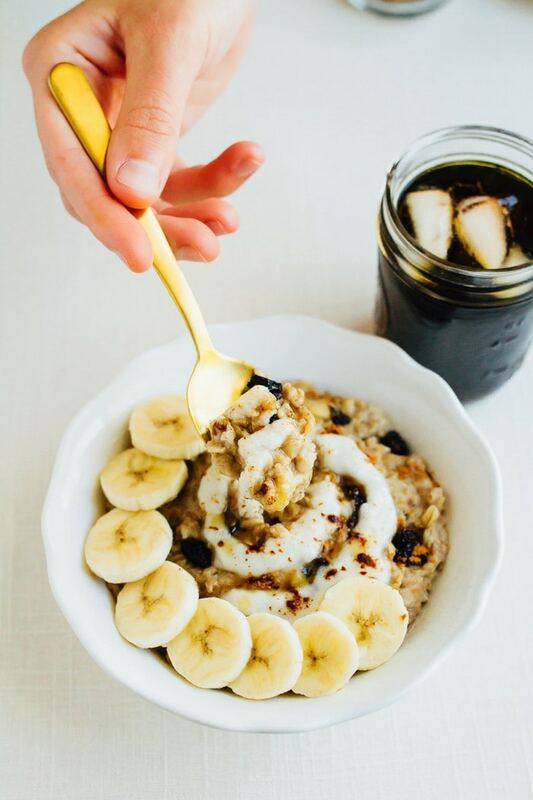 It’s time to ditch those instant oatmeal packets! This recipe is an EBF original, from back in the day when I would post everything I ate on the regular. Lots of my old posts include multiple recipes within a single post or recipes without photos. The horror, right? I’m a very visual person and always like to see a picture of a recipe before trying it and I’m sure many of you are the same way so I’ve been looking through the archives for hidden gems to re-share and this recipe is one of those oldie but goodies. It’s fun to bring some of the old recipes back to life. This particular recipe is one I used to make ALL THE TIME as it was my go-to breakfast for quite a few years. 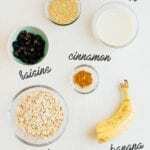 The base recipe is always the same — oats, water, banana, cinnamon and raisins — but the toppings change depending on what nut butters I have on hand. This time around I used maple syrup and coconut butter because I just made a big batch of coconut butter last week, but any nut butter will taste amazing on this bowl. If you really want to stick with the cinnamon raisin theme, my cinnamon raisin almond butter would be perfect. Grab all the ingredients and try it for yourself! 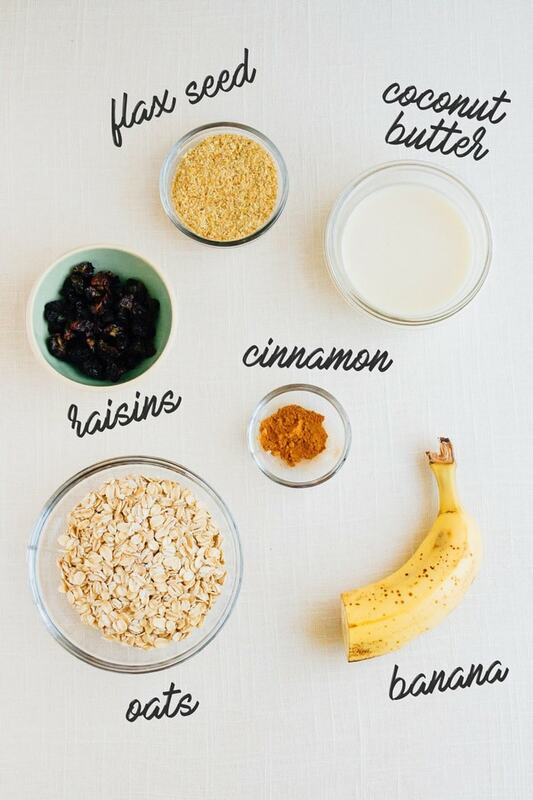 Add oats, banana slices, raisins, flaxseed, cinnamon and sea salt to a pot. Add water and stir to combine. Heat over medium-high heat for 8-10 minutes or until all the liquid has been absorbed. 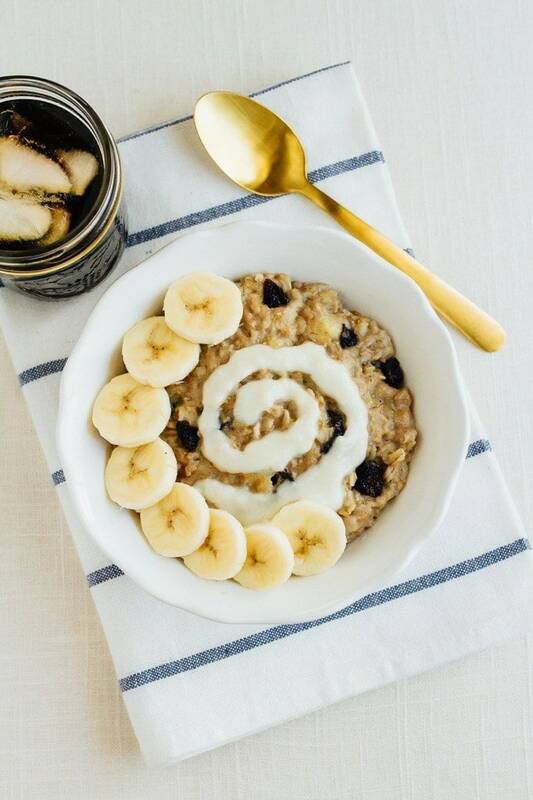 Be sure to stir the oats several times while cooking to make sure the banana slices melt into the oats. You’ll know the oatmeal is done when all the liquid is absorbed and the oats are thick. 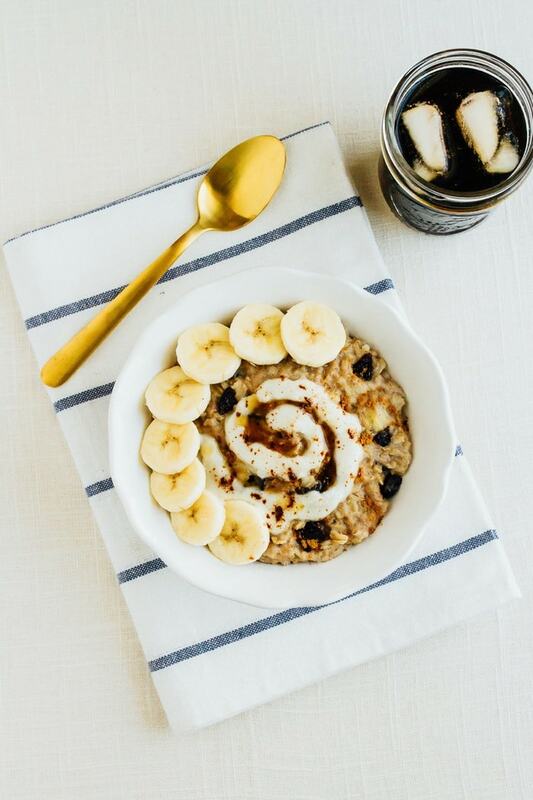 Portion oats into a bowl and serve with coconut butter, maple syrup, banana slices, and a sprinkle of cinnamon. 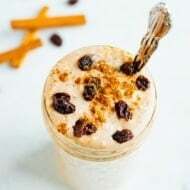 If you try this cinnamon raisin oatmeal recipe be sure to leave me a comment and a star rating below. Your feedback is helpful for everyone who is part of the EBF community. I make oatmeal a lot but tend to stick to pb and banana. It’s so nice to have a new flavor combo to try! Yum! 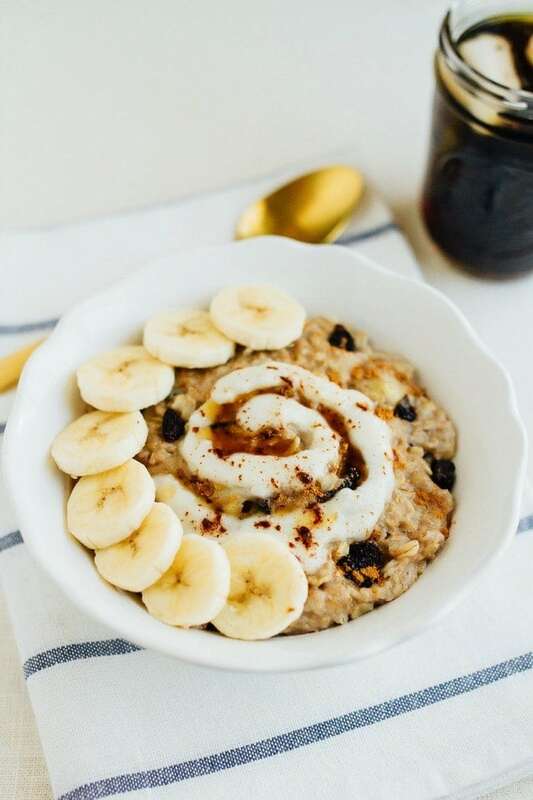 This looks amazing – I eat oatmeal everyday and absolutely love it! Ah, I love cinnamon and raisin together. This bowl reminds me of the fall! I feel like I can almost smell it coming out from the page! What a beautiful bowl of oats! I have oatmeal at least a few times a week, but haven’t done cinnamon raisin in a while. Always nice to return to a classic. Totally agree. 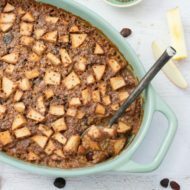 Cinnamon raisin is a combo I often forget about! Hope you like this recipe, Em! Love the pictures! The golden spoon is cool! Thanks Patrick!! 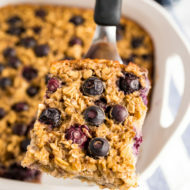 I hope you get a chance to try the oats! Today will be the second day in a row I am making this feel good breakfast. Out with the flu and this recipe contains a few get-well ingredients. Adding a little bit of ginger, too. Thanks Brittany! !